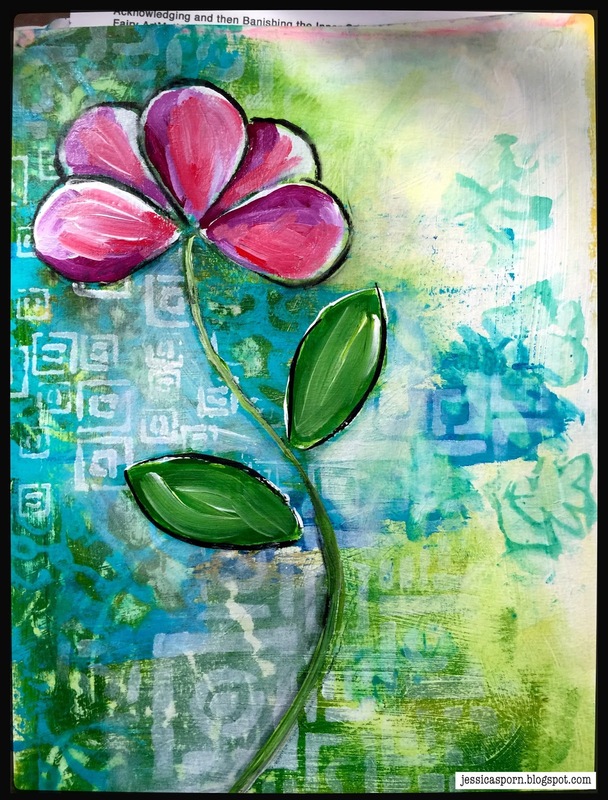 StencilGirl Talk: Household Items and StencilGirl Stencils - A Perfect Combo! 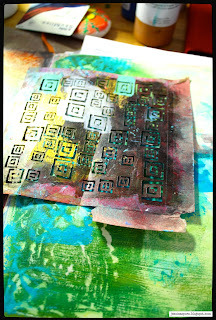 Household Items and StencilGirl Stencils - A Perfect Combo! Hi - Jessica Sporn here to show you how to make a pretty floral canvas or art journal page using your favorite stencils and household items, like toilet paper rolls, toothpaste caps, bubble wrap and more! 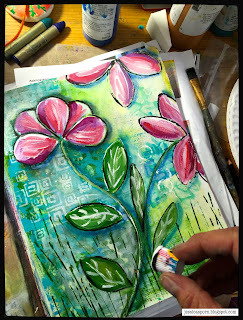 So gather up some stencils, gesso, an old room key, some paint, your art journal or a canvas, and let's go! 1. 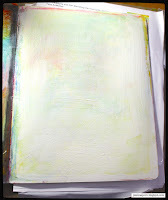 Prep a journal page or canvas with white gesso. Apply it with a brush or a credit card. 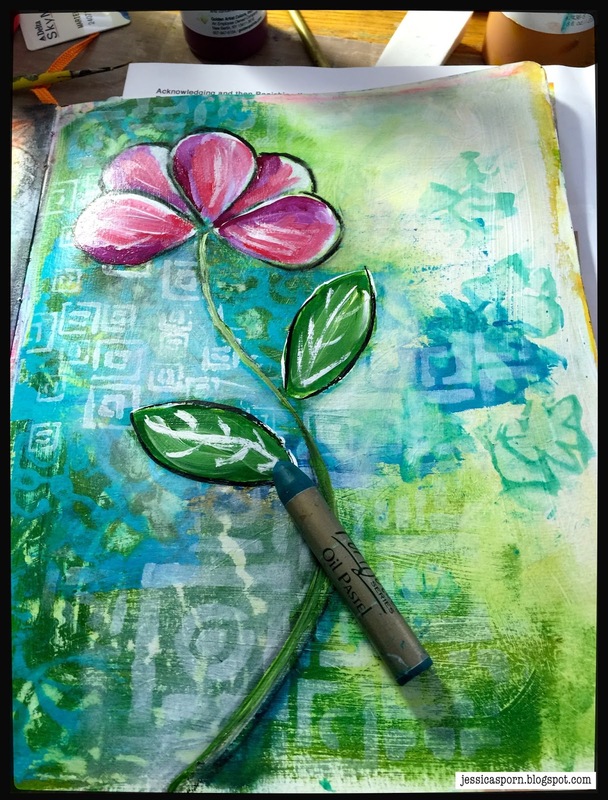 Keep your application pretty thick, and while it is still wet, use the back of a skinny paint brush or bamboo skewer to etch in some journaling. Let dry. 2. Pick two analogous cool paint colors such as a green and a blue. 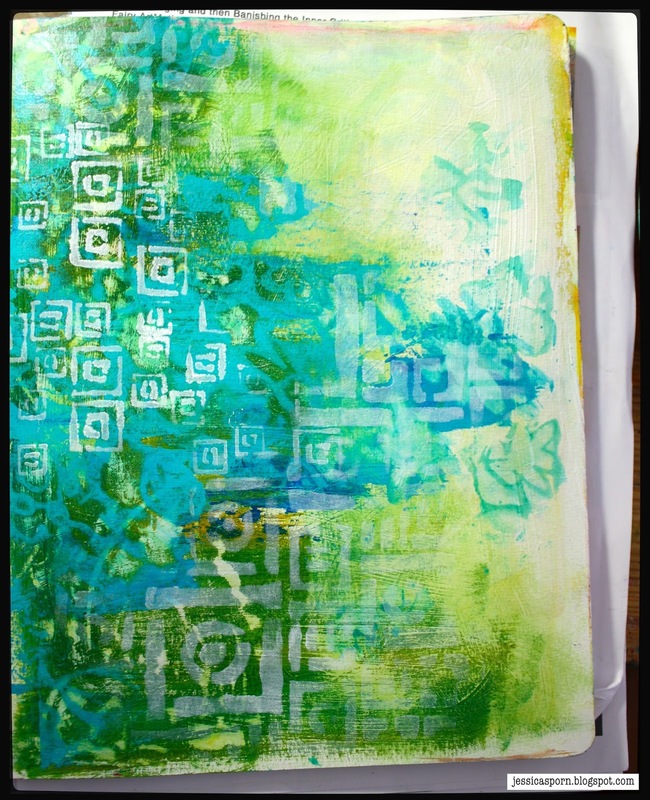 Using one color, scrape or paint some of it randomly across one side of your substrate. 3. 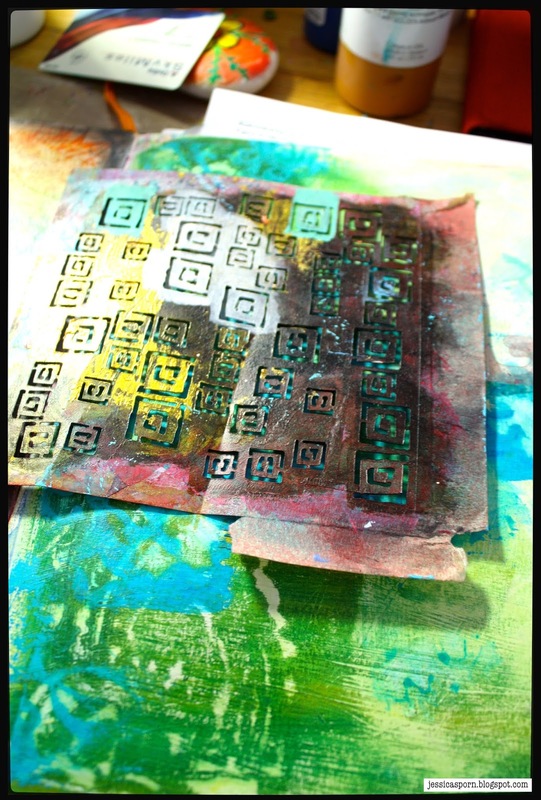 Repeat this process with your second color and a different stencil but do not cover all of the first color. (I used the Hearts, Flowers and More stencil.) Let dry. 5. Next, we are going to make petals. A pinched toilet paper role is perfect for this, or use your favorite stencil. Either way, create your flower petal shapes using either a stabilo black pencil (if you're tracing a stencil), or dip your toilet paper role into black acrylic paint. 6. 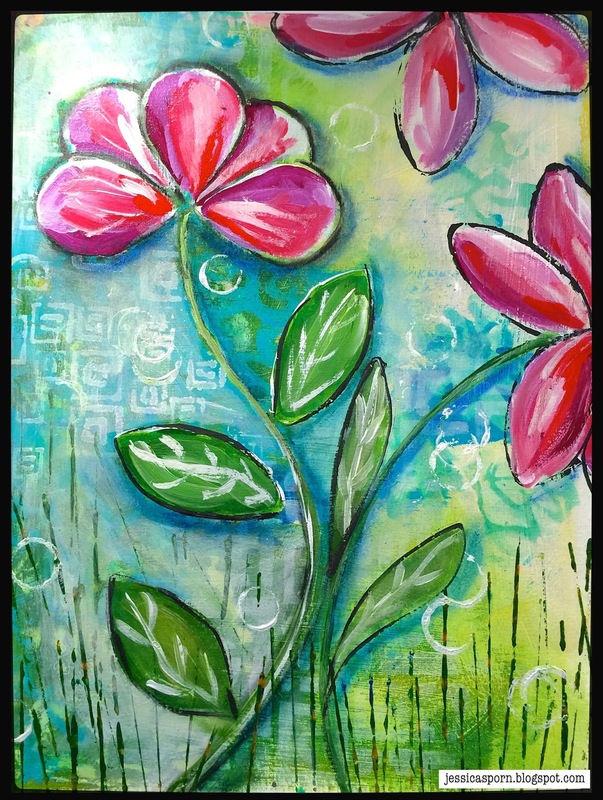 Paint in your petals with titanium white paint or white gesso. 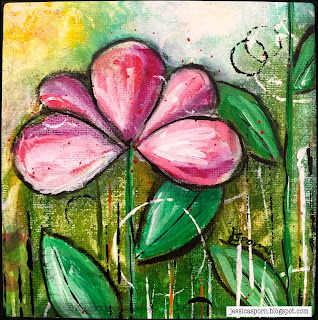 If you used cool colors for your background, use warm colors (pink, red, magenta, yellow, orange) on the still wet white paint to add color to your petals. 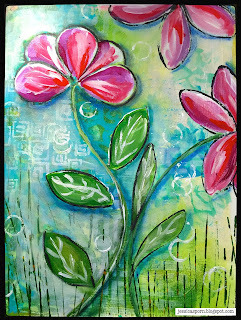 Use loose brush strokes, and try not to blend the paint too much. 7. Use your green paint to make a curvy stem. Pinch your toilet paper roll again and stamp leaves. 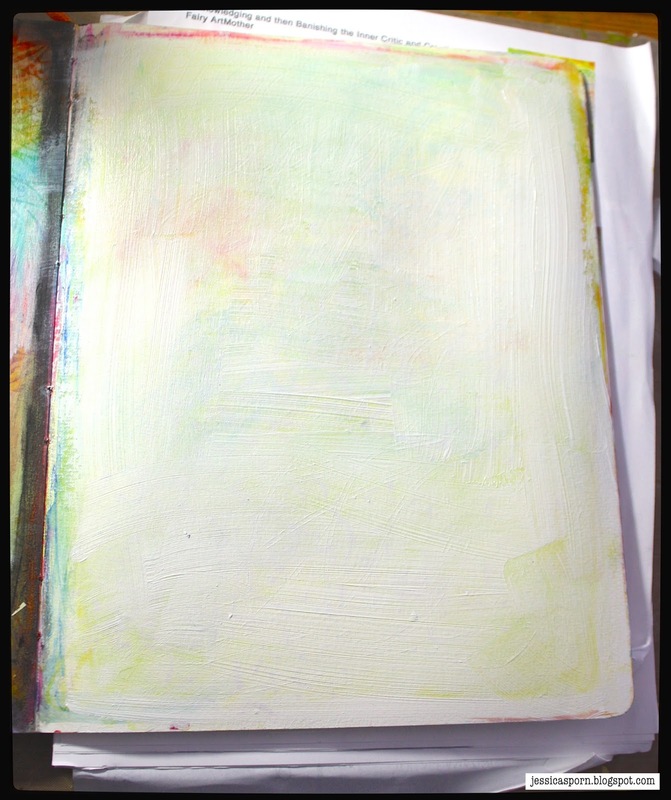 Fill them in with white and green paint, maybe adding some veins and interest. 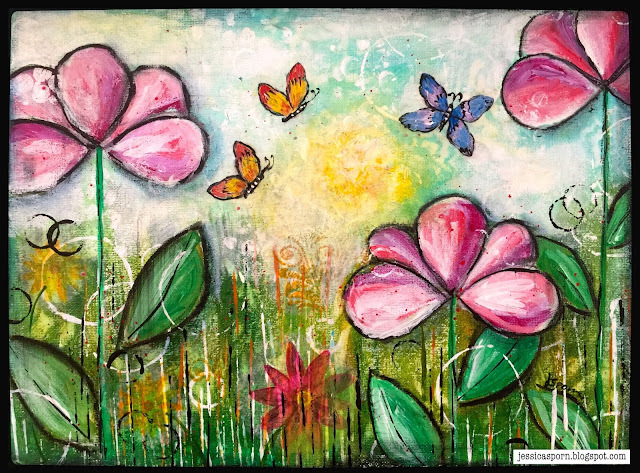 Make as many flowers as you wish. Use portfolio pastels or other media to create some shadows. 8. Use the side of a credit card or room key to add some grass. 9. 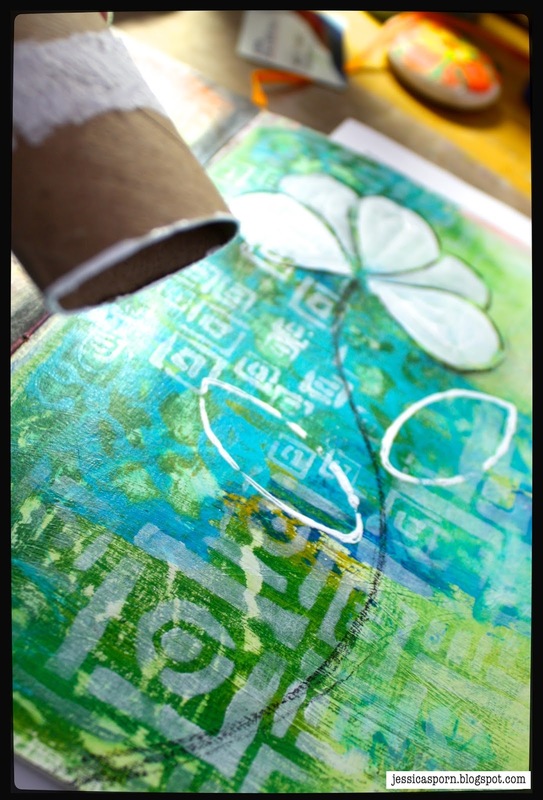 Use a toothpaste cap to add some small white circles, or use bubble wrap, or splatter. 10. 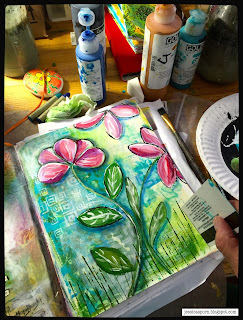 Keep adding embellishments, text, etc., until you feel happy with your creation. 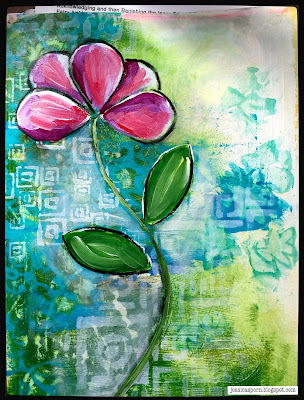 Create fanciful flowers in your art journal or on a canvas! 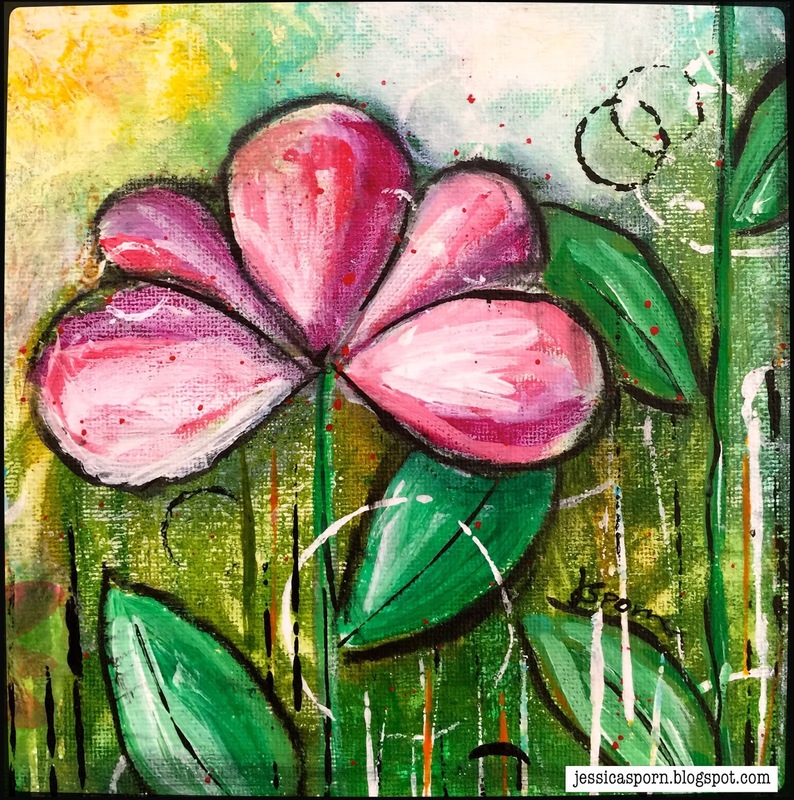 I hope this post gave you some ideas, and gets your creative juices flowing! For more tutorials using StencilGirl stencils, visit me at my blog! Beautiful page! I love seeing how you built up the layers. 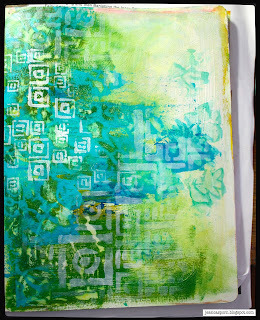 And I always forget what great mark-making you can do with household items - it turned out fabulously! Thanks Gwen! It was so nice to meet you in CT. Hope all is well! Simply stunning! Absolutely love this!!! Thank you Jean! I'm so glad you stopped by. 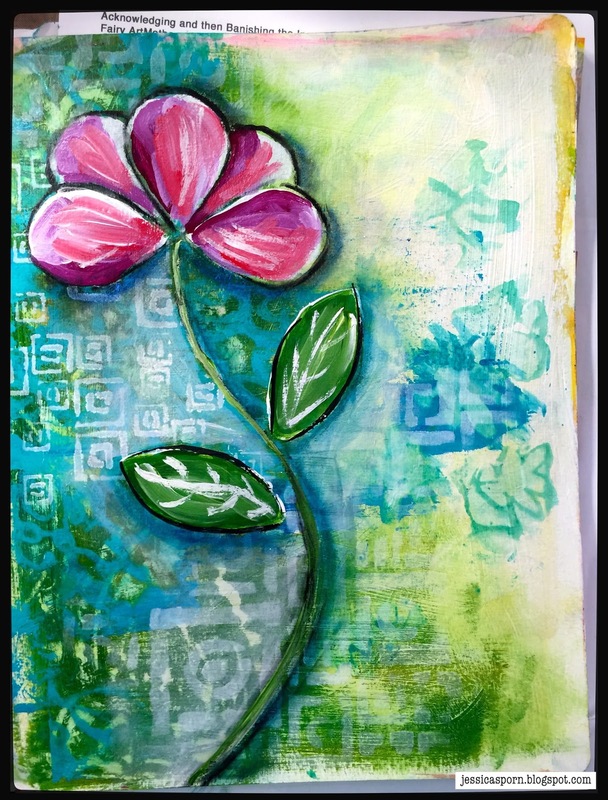 Love this style and technique Jessica!! So pretty and bright! LOVE LOVE LOVE LOVE LOVE - so beautiful. 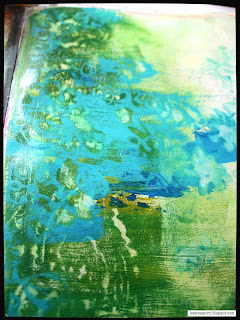 I love the idea of the gesso underneath. I'm going to have to buy some and play with it!